One of the major pieces of the Pocket Places street re-design was to address several concerns around accessibility in the centre of town. Making the area outside the station and outside McDonalds feel less like a busy highway and more like a town centre which can be easily shared by everyone. As part of the ongoing design process we are planning a temporary pattern on the road in this area. 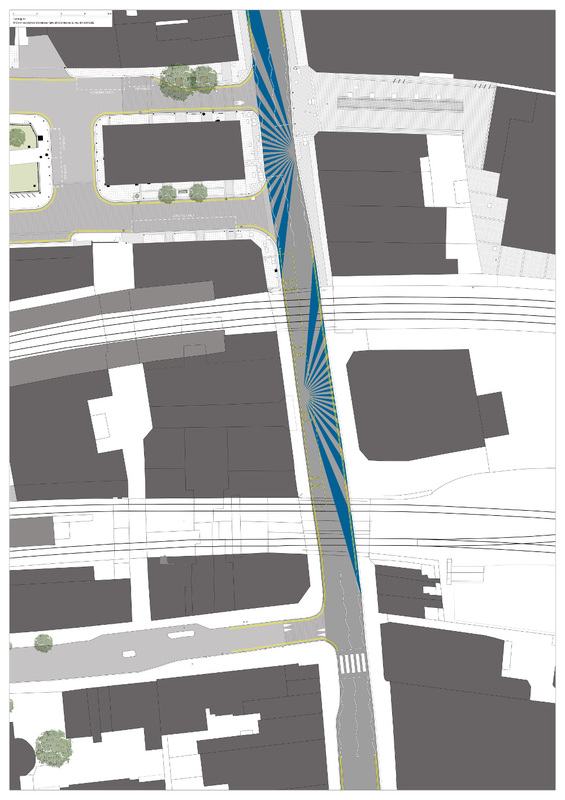 Using a sun beam motif we are highlighting the movement of pedestrians. By creating an unusual environment for motorists, which is less like a conventional road, we aim to encourage them to be more aware of pedestrians, and thus encouraging them to slow down. This technique is sometimes referred to as psychological traffic calming, and it aims to change the mindset of road users – it asks drivers to think differently and re-connect with their surroundings rather than forcing them through physical features like speed humps. It has been proved to be successful elsewhere. We hope that it encourages people to think about and use the street in different ways. We will be watching closely to see. (Please click on the plan below to enlarge it). In addition to improving the environment for pedestrians we hope that this bright, colourful and fun feature will add to the sense of place and celebrate the diversity and vibrancy of the street. We are doing this in response to early discussions with people in Peckham about the narrow pavements and the heavy pedestrian traffic in this area and also with a view to the future when the square in front of the station may be opened up, attracting even more people on foot. This is also being seen as a way to link the station with its immediate surroundings as well as linking the pocket place at Holly Grove and Elm Grove with the area in front of the Peckhamplex cinema which is already a popular walking and cycling route. For now, what we are doing is a temporary measure, the paint we are using is a non-toxic eco temporary paint which will wear off in a few weeks, we will be painting it at the start of June. If the effects of painting the ‘Rye Lane Sun’ on the road are positive then we know that we need to make some more robust permenant changes to keep it that way. Sustrans have been using these ‘Psycological Traffic Calming’ techniques for several years, often in association with other calming methods such as raising the road to slow traffic to the point of allowing a more positive pedestrian environment. You can see a video here (http://www.youtube.com/watch?v=WawJKtvVHKs)about a street in Oxford where they created a ‘street carpet’ with paint to slow down speeding traffic. These methods are proven to support a better balance of space between all users of the street, you can find the research that supports this approach here… (https://www.gov.uk/government/publications/manual-for-streets). 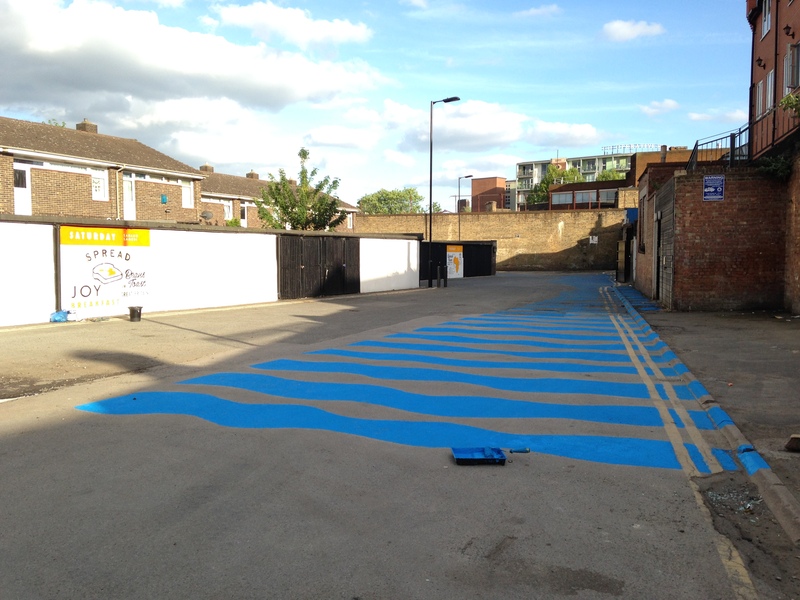 We originally asked our mailing list what colour we should paint the ‘sun’ and most of the suggestions were for blue, there are concerns that it may get confused with the Cycle Super Highways so we are making sure to choose a different shade. Here’s what we have already done in Bournemouth Close towards the Southern end of Rye Lane to encourage motorists to slow down and give more priority to pedestrians and it has been really successful in changing the way most motorists behave in this area. Are you using ‘Green Street Media’ for the paint? Hi Eddie, no we used Ecos organics temporary paint. It’s non toxic and lasts for a couple of weeks depending on traffic. The paint isn’t waterproof or wasn’t dry this morning. Shoes, legs, shorts and bike all splattered with blue paint on my usual commute along Rye Lane today. So sorry Rob, it started to rain the second it hit 5am when the road was reopened and made the paint move a bit. Should be fixed with dry weather today. Please accept my apologies, it is temporary paint so should come off clothes with water and elbow grease. Blue paint..waste of money..what was the cost of workers out of hours deployment.?? footways need to be opened up again..traders made to keep their displays in their premises snd not expand onto public footpath..also their rubbish must not be left on the footways..look at Rye lane at 08.30 today…its a disgrace.. Interesting idea. Seeing it in the road, I don’t think the sunbeam itself works, perhaps because of the narrowness of the road. I agree with what some of the previous commenter says about there being some more basic actions which would improve life for pedestrians. Firstly the speed of traffic: I’m not sure that calming is needed, but a clearly marked 20mph speed limit would be welcome. More importantly, actions to ease congestion on the narrow pavement areas, which currently force pedestrians to step into the road. That includes addressing the problem of rubbish always being piled on the pavement; moving the bus stop a short distance south to where there is more space to walk; restricting the amount of pavement space which some businesses take up; replacing the large free-standing bins with lamppost-mounted ones. I would be very interested to hear what our newly elected and re-elected councillors for The Lane ward are doing to improve life on Rye Lane. It looks great – really eye catching, an innovative way of looking at this. Would be interested to hear more!